Updated in line with the new primary science National Curriculum Programme of Study Incorporates the latest research findings Covers the new National Curriculum elements and other more advanced material including Drugs, Energy, the Environment and EvolutionIncludes new boxed features: Did you Know?, Famous Scientists, and Be Safe This easy to navigate and friendly guide is a superb toolkit to support you as you prepare to teach in the primary school, irrespective of your training route. "This essential, clear and readable text is a must! 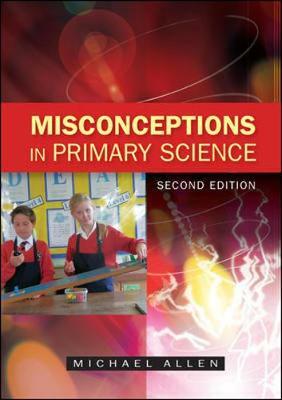 As well as identifying the main misconceptions it succinctly explains the science content for teachers to refresh their own understanding and offers really useful guidance and ideas to help reconstruct learners' misconceptions. It is a most welcome resource for anyone involved in primary science teaching and should be in every classroom!" "Michael Allen's book is excellent. He writes specifically for primary teachers to catalogue a strong list of children's common ideas and misconceptions in early science, and suggest constructive ways in which these can be addressed in the course of classroom discussion and activities. This is an enormously valuable resource, each section outlines the form of common misconceptions and suggests lucid and effective tactics that might easily be used. The text is authoritative and well sourced, the figures and drawings are clear and constructive. The admirable key to the book is that, of course, not all the learning to take place will be that of the pupils."